Musiktage am Rhein - Anne Shih - rhein-fine-musik-festivals Webseite! Anne Shih was born in Edmonton, Alberta in 1968. The eldest of three sisters who all became internationally renowned classical musicians, Anne began playing the violin at the age of five, began formal lessons at seven, gave her recital debut in Vancouver at eleven and made her debut with the Calgary Philharmonic at twelve. Equally prodigious as a pianist, Anne started studying this instrument at the age of ten and 18 months later was awarded a top prize in piano from the Royal Conservatory of Music in Canada. 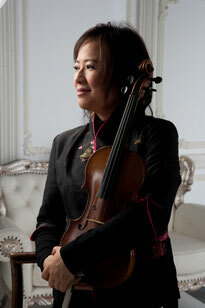 By the age of 17, Shih had won prizes at many of the important national competitions, on both instruments. She was also awarded the Salzburg Mozarteumspreis. Mentored by the legendary Josef Gingold at Indiana University from 1986-91, Anne Shih became Gingold’s last teaching assistant at the age of 21. She was recipient of the university’s 1988 International Student Academic Achievement Award for outstanding scholastic performance and received her BM and her MM with highest honours. She has also worked with, assisted and performed with Denes Zsigmondy in Seattle, USA as well as in Germany, Italy, Hungary and Austria. Anne’s solo and chamber music performances as a violinist, violist and pianist have taken her to concert halls across North America, Europe and Asia. Her chamber music partners have included Julianne Banse, Giacomo Battarino, Julius Berger, Roger Chase, Lluis Claret, Jose Gallardo, Josef Gingold, Oliver Kern, Oleg Krysa, Robert McDonald, Hartmut Rohde, Guido Schiefen, Connie Shih, Andor Toth, Tilmann Wick, Sung Won Yang, Denes Zsigmondy, and the Borealis Quartet. A special highlight was Shih’s performance of Schubert’s Trout Quintet at London’s Wigmore Hall, with colleagues Raphael Wallfisch, Ruth Killius of the Zehetmair Quartet and sister Patricia Shih (leader of the Borealis Quartet). This remarkable tour de force led to an immediate reinvitation to play the complete Grieg violin sonatas at the Wigmore with pianist Connie Shih later that year. The international press have hailed her as “Brilliant and Virtuoso”, “Germanys’ next Superstar”, “Virtuoso and Spiritual” and “Phenomenal” (Frankfurter Allgemeine Zeitung and Süddeutsche Zeitung, Germany).